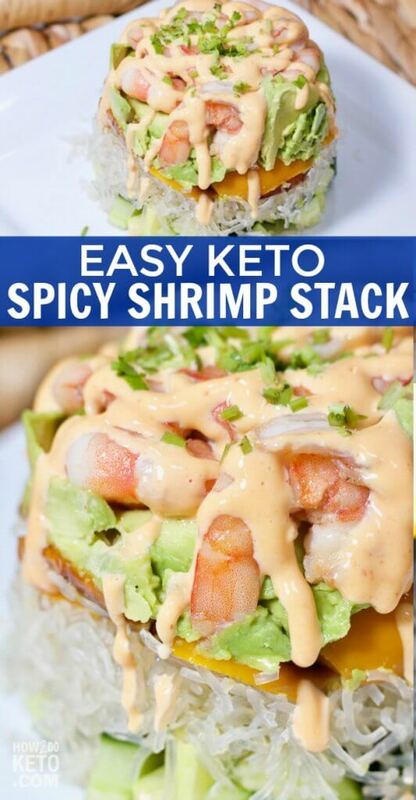 A low carb version of one of our all-time favorite recipes, these Spicy Keto Shrimp Stacks are ridiculously flavorful! 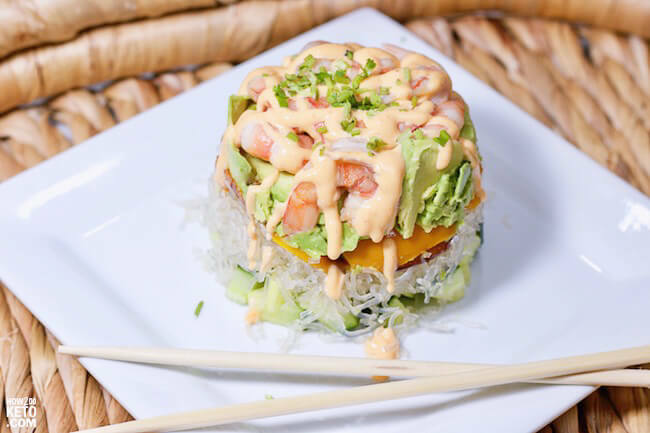 For your convenience in re-creating our Keto Spicy Shrimp Sushi Stacks recipe at home, we’ve included shop-able ad links to some of the products and supplies used. Read our disclosure policy here. 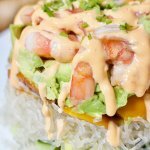 This Keto Shrimp Stack recipe is based on one of my all-time favorite dishes: Baja Shrimp Stacks (which are made with rice and definitely not low carb). However, with a couple simple substitutions, you’ve got an amazing keto-friendly meal! Seriously, eating keto is EASY when you’ve got food like this! I love kelp noodles because they are extremely low in carbs, but provide that delicious al dente texture of real noodles. If you can’t find the kelp noodles at your local grocery store, you can simply omit. However, my husband recently found these kelp noodles which only have 2 grams of net carbs for the entire bag (3 servings)!! I repeat: 2 grams net carbs for the entire bag!! 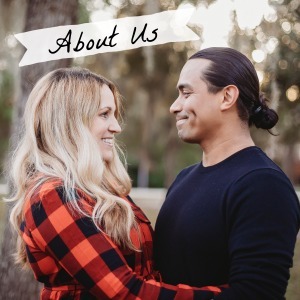 Related: Learn how many carbs you can have on the keto diet! *Coconut aminos are a magical thing – similar in taste to soy sauce, but with no sugar, about 70% less sodium, and it’s gluten free! 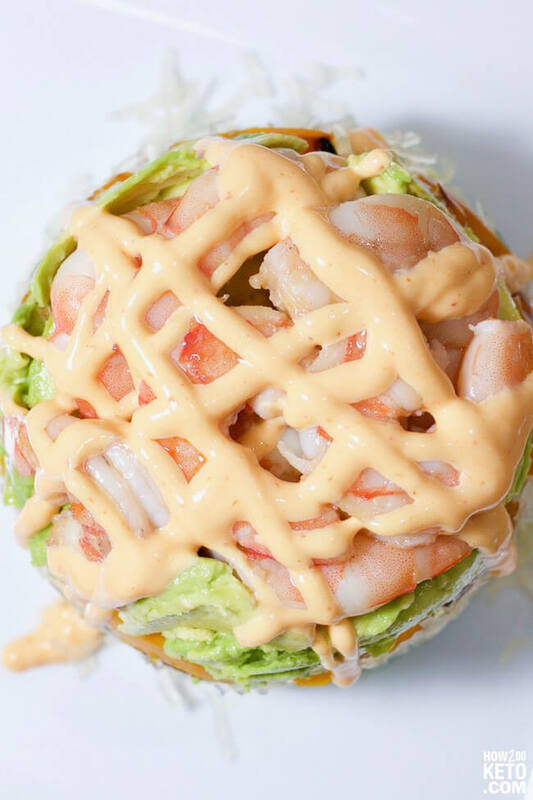 The above is a quick glance at the ingredients and tools needed to make Keto Spicy Shrimp Sushi Stacks. Full ingredient amounts are available in the printable recipe at the bottom of the post. 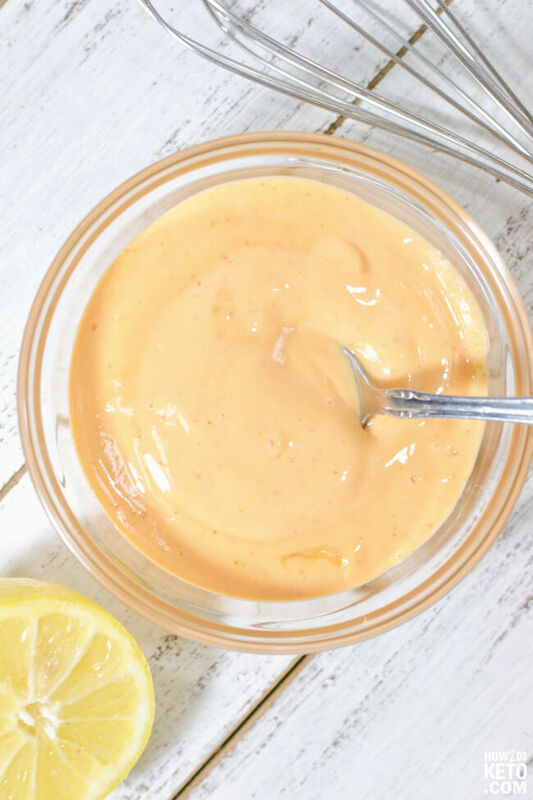 Making your own spicy mayo is super easy! This way you’ll know exactly what goes into it (a lot of pre-packaged spicy mayos have additives and/or sugar). Click here for our Low Carb Spicy Mayo Recipe. Sauté shrimp chopped yellow bell peppers in 1 Tablespoon coconut oil and 1 Tablespoon coconut aminos for 3-5 minutes. In a small mixing bowl, whisk together ginger sauce ingredients. Allow cooked shrimp to cool while you prep your veggies. Chop kelp noodles so that they are similar in length to long-grain rice. 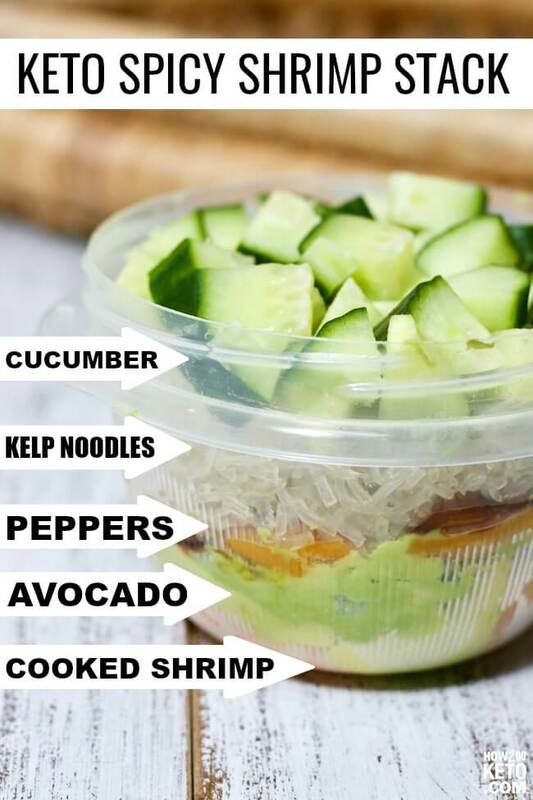 Layer your ingredients in a plastic container, about 1 cup in size: shrimp, avocado, bell peppers, kelp noodles, and cucumber. Press gently to pack your shrimp stacks. Carefully flip your container over onto a plate and wiggle gently to release your shrimp stack. 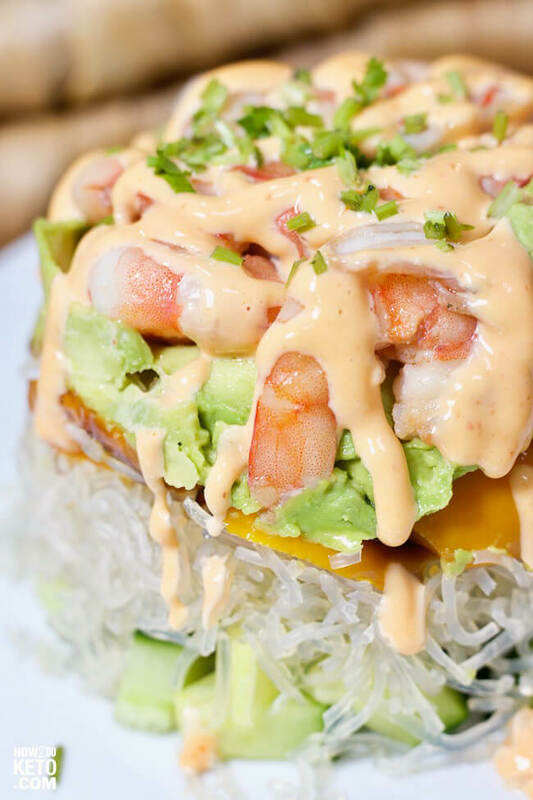 Drizzle with ginger sauce and spicy mayo. Garnish with chopped cilantro and/or green onion if desired. Keto Egg Salad Wraps - Only 1g Net Carbs!